Some time ago I covered how to use custom deleters with smart pointers. The basic idea is to specify a dedicated method that will be called when a pointer is released. One logical application of custom deleters might be resource handles like files or the WinApi HANDLE type. Let’s see how can we implement such thing. Modern C++ offers robust methods to minimize resource and memory leaks. You can almost forget about raw pointers and just be using smart pointers. By default, smart pointers work on pointers, but we can reuse their capabilities and apply it to resource management. BTW: you can even watch the latest talk from Herb Sutter about “Leak-Freedom in C++… By Default” from CppCon 2016. But let’s discuss some basic things: for example FILE* needs to be opened and closed (via fopen() and fclose() methods). If you forgot about closing the stream, you would risk not only some memory leaks but also locking file or even corrupting it. A similar thing happens for the HANDLE in WinApi, you need to create it and then release by CloseHandle(). BTW: The system will/should release all allocated resources by a process when that process is terminated, still this is no excuse to clean stuff on your own! See here: MSDN: Terminating a Process. FILE handle is used in CRT api to manage files. We need to wrap the fclose() function in the deleter. Such stateless functor will make unique_ptr just as small as only one pointer (because of optimization, the functor object doesn’t need additional memory…) - see Empty base optimization. Note, that such construction might be not as efficient as using make_shared. We could be more advanced here and create a custom allocator that handles creation and deletion of the resource. That way we could invoke allocate_shared. That’s all! No need to worry about fclose now. This might not be a problem when there’s only one file. When there are more files, then you need to pay attention to call fclose when some operation fails (like opening a new file). As in our example, if the second file cannot be created, then there’s no need to take care of the first (already opened) file. It will be closed automatically on error. In this article, I’ve quickly covered how to implement smart pointers for resources like file handles or generic Windows kernel handles. You could easily extend this and have a range of smart pointers for other types like texture handles, shaders even library’s custom handles (like SDL_Surface): every time you have a special code that needs to be executed on deletion there’s potential to wrap it as a deleter for a smart pointer. Do you use such custom deleters in your applications? What kind of resources have you wrapped? 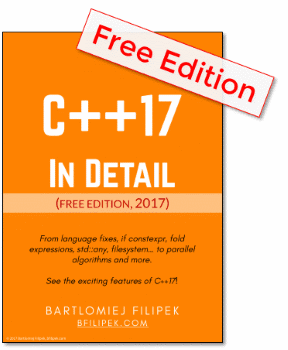 Bartek’s blog: Custom Deleters for C++ Smart Pointers - more about custom deleters.